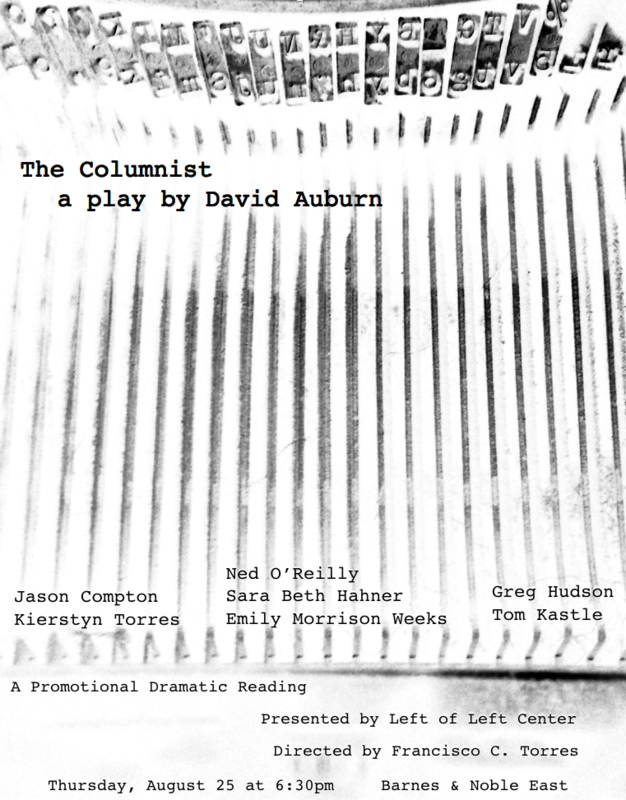 Left of Left Center presents its first promotional dramatic reading, The Columnist by David Auburn. Auburn is perhaps best known as the writer of Proof, a Pulitzer and Tony winner. The Columnist is his first full-length play in 12 years. Thursday, August 25 at 6:30 PM, at Barnes & Noble East Towne Mall. This presentation is directed by long-time LOLC collaborator Francisco Torres, and features the talents of Ned O’Reilly, Jason Compton, Sara Beth Hahner, Greg Hudson, Kierstyn Torres, Emily Morrison-Weeks, and Tom Kastle. One night only. No charge for admission, all are welcome and invited to attend.